Finding good solar panel installers. It has shown that as many as 7 out of the 12 companies selling solar technology recommended putting solar panels on a shaded part of a roof, and a third of solar companies are over-estimating the energy generated by PV electric and solar heating panels. “This is not on”, says Stuart, who founded the Heat my Home website in 2004 to help people find the correct information when purchasing solar panel technology. “We need people to have confidence in the solar industry, to have confidence that solar companies are giving correct and trustworthy information, and that’s exactly why this website exists”, says Stuart. The feed-in tariffs scheme’s introduction brings new and inexperienced solar companies in the market, which are springing up across the country to take advantage of the boom in solar panel installations underway. It’s worrying that, in some cases, it appears that homeowners ask for necessary information about their energy consumption, for example. “We at Heat my Home want to say that the majority of solar installers operating in the solar industry are experienced, knowledgeable and trustworthy, but sometimes let down by their salespeople who have very high sales targets and commission in mind when dealing with customers” concludes Stuart. We all know that the cost of energy will continue to rise in the long-term, and with gas and electricity prices increasing every quarter, both domestic and business consumers are searching for other, cheaper forms of energy. Surprising to some people, solar panels are the most efficient and long-term option available, even in the United Kingdom’s climate, so when you add in the government’s feed-in tariffs, such as the Renewable Heat Incentive for solar heating. The Clean Energy Cash Back Scheme for solar electric, it is no wonder that some companies think they can jump on the bandwagon and take advantage. “As a responsible and long established company, we have amassed a wealth of information over the years, which we hope will be a guide for consumers looking at the potential of solar panels or even taking the plunge and getting an installation. We do believe in this technology’s potential, and it would be a shame if a few spoiled it for the many. Installing a solar panel system does mean investing your money, but the potential profits from the feed-in tariffs are very impressive if you are staying in your home long-term. Even if you are not, solar can make your home more saleable and worth more on the housing market if installed correctly by a reputable company. A report by the NHBC has highlighted issues arising from the shoddy installation of solar panels. There have been some cases of roof leaks originating from shoddy quality, so finding the correct company is essential. 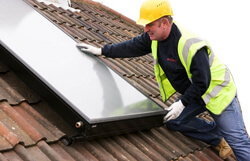 As a useful guide, only use solar companies or installers who have MCS (Micro Certification Scheme) accreditation, which ensures the quality of the system is of a good standard. The REAL scheme is another accreditation which ensures its members adhere to strict selling and installation guidelines, and companies who don’t abide by them. Heat my Home is also available not only as an information resource but also can guide customers wanting quotes to a reputable and accredited solar company through our ‘Get a Quote’ section of our website.